A foundation bed is the perfect spot for a flower garden. It’s small enough to be planted quickly, and the backdrop creates an instant stage for plants. Plus, you get to see your handiwork every time you enter or leave the house. This design features flowers with various colors, heights, and habits—intermingled for a cottage garden look. Good to Know: Repetition keeps the flowerbed from looking chaotic. Orange, yellow, white, and purple are repeated throughout the bed. The hanging basket and rail planters match. And the painted pots and butterfly house coordinate with the color of the home. Terracotta pots have a timeless appeal, but a coat of paint brings a fresh look. Use a concrete paint—covering both the outside and inside of the pots so moisture doesn’t cause paint to blister. With its clouds of diminutive white flowers, ‘Diamond Frost’ euphorbia adds fine texture to the bolder marigolds in hanging planters. Both euphorbia and marigolds are low-maintenance and able to withstand heat with occasional watering. A colorful shrub in warm areas of the country, lantana is a dependable annual elsewhere. It has a pungent fragrance and boasts bright blooms of yellow, orange, pink, and mixes. Spidery flowers (also available in magenta) give cleome its other name: spider flower. The white-flowered variety partners well with the yellow and orange flowers in this bed. 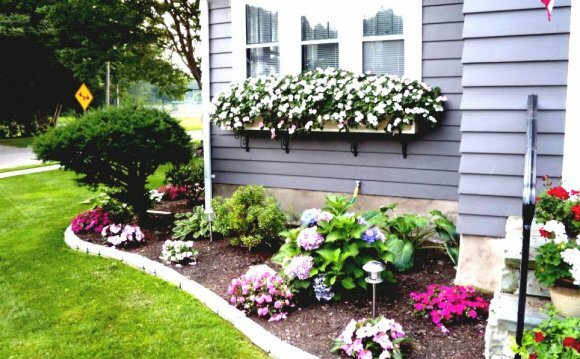 It’s a prolific self-seeder, so you’ll get free replacement plants every year. A mildew-resistant zinnia with cheerful daisylike flowers, Zinnia angustifolia grows without pampering. It reaches 8–24 inches tall, depending on cultivar. The large flowers of Profusion Yellow, a zinnia hybrid, are hard to miss—and they keep showing off all summer. Plants grow from 12–15 inches tall and are resistant to mildew. Also known as flowering tobacco, nicotiana is an adaptable annual with a season-long show. Shorter varieties boast trumpet-shape flowers in colors such as pink, white, salmon, red, and lime. Angelonia is a tender perennial (winter hardy in Zones 9–11) used as an annual elsewhere because of its upright habit and stalks of bright flowers. It loves hot weather but needs plenty of moisture. Colorful and easy to grow, calibrachoa is like a small-flowered version of petunia. Also called Million Bells, it’s especially suited to growing in pots or along the front of a flower border. Sweet potato vine looks great spilling out of a container or onto a sidewalk. The heart-shape leaves are available in burgundy, lime, and variegated colors, offering a pleasing contrast to companions. Everyone knows how important it is to make the first impression. Those who visit your account on Facebook, Twitter or other social media, first of all, pay attention to your photos. That's why it's extremely important to make the picture vivid and memorable. That's why you might need special effects. That's why you need a website of PixEffecter. The experts will help you to add any pix effect you want. You should only choose what you want to get, upload your own picture and click the necessary button.